And yet this woman was the moving spirit behind many modern projects, which even now would make people frown. She is Catholic, yes, but not a Catholic of the reactionary type. Whoever suggested that she belongs to Opus Dei couldn’t be further from the truth. Her faith inspired her, even as a teenager, to go out and help those in a less privileged situation. She would wander the streets of Madrid to bring food and other supplies to the poor families in town, and as a Queen she continued in this spirit. She was the first Queen of Belgium to have a fully operational social secretariat. This department gave financial help only to those most in need. It also acted as a mediator between the people and the official agencies which could help them get out of their trouble. She organized the secretariat in such a way that it could work with the utmost efficiency. The Queen always had and still has a heart for those in need. The Queen was and still is a valiant defender of the rights of women everywhere. She always believed in equal rights for men and women, and never hesitated to encourage organizations which supported this cause. She so enjoyed her independence that, even when she was a queen, she would get into a car alone and drive to the centre of Brussels to go shopping. She even travelled as far as Paris by train, all by herself, to visit her friends there. She was revolutionary, being one of the first public figures to hug and kiss an AIDS patient in front of the cameras. She also fully supported and even gave her name to the Queen Fabiola Villages, where the mentally disabled could live, more or less independently, and where they had the opportunity to experience life in all its aspects, where they could find others just like them, fall in love, and even marry. In these villages, the disabled were given a chance to integrate into society, which even now is revolutionary in some aspects. Fabiola and Baudouin are legendary for their social engagement. Their most famous cause is probably their fight against women traffickers. The King and Queen were deeply moved by the sight of the many prostitutes in the “Schipperskwartier” in Antwerp. Many, if not all, of the women they saw there, were victims of human trafficking. The royal couple never disdained these women for what fate had forced them to become; on the contrary, they became the most vocal advocates for this neglected and disenfranchised group. They publicly supported the organizations which tried to help these unfortunate women who were forced into prostitution and who had nowhere to turn because they had no residence permit or even proof of identity. One woman, who had managed to escape her fate thanks to that support, was even asked to read at the funeral of the King. Fabiola had the gift of being able to really listen to people. She was social and open, and very down to earth. I don’t think there is any Queen who could be less glamorous than she was, but there are also hardly any royals who are so open and approachable as she is. Her interest in the people was never feigned, and her communication with the public came straight from the heart. She cried with her nation and laughed with them. She was, and still is, a Queen among the people. That innate natural charm allowed her to reconquer the British hearts. When King George VI died, the Belgian King had refused to attend his funeral. Protocol demanded that he did not attend the funeral of a Head of State of a country to which he had not yet paid a State Visit, which was the case here. This is why Elizabeth II sent Princess Margaret to the Belgian royal wedding instead of going herself. But Belgium was determined to defrost the cold diplomatic relationship with the United Kingdom. The official State Visit of the Belgian King and Queen was an almost unilateral happening. Buckingham Palace did not exactly refuse all cooperation, but they didn’t really help either. However, Queen Fabiola, being her usual radiant, open self, soon found her way into the hearts of the people and almost single-handedly restored the friendship between the two countries. Apart from her social involvement, the Queen is also known for her love of children. Even before she was married, the sight of children delighted her. Her brothers and sisters all had large families. In the end she would have no fewer than 37 nieces and nephews, for whom she wrote her famous fairy tales. Los doce Cuentas maravillosos contains twelve fairy tales, all with a very strong Christian undertone - one critic even claimed they were conversion stories instead of fairy tales. The various characters, ranging from princesses to gnomes to animals, learn to leave behind their various bad habits and love and care for others selflessly. One of her most famous fairy tales is “The Indian Water Lilies”, in which an ugly, evil witch casts a spell over two moon fairies who stayed behind to dance on the water while their sisters had already returned to the sky. She wants to take away their glow, but the little fairies still retain their beauty. Outraged over this injustice, the witch turns the fairies into snow-white water lilies. Every night at midnight, they are allowed to turn into fairies again and dance on the water in the moonlight, but they can never return home. In the Efteling theme park in the Netherlands, one of the attractions is dedicated to this tale, even though they took some liberty when recreating the story, showing seven fairies on the lake instead of two. After Fabiola became Queen, her Fairy Tales were translated into over 70 languages. The book was a bestseller in Belgium for decades, and when a few of her tales were recorded, the albums were just as successful. The Queen donated the royalties she would have earned to various good causes. It is well known that she always wanted to have children, but fate chose differently. Until about a year ago, nobody knew how many miscarriages the Queen had suffered. But everyone knew how painful this unfulfilled wish was to her. No matter where she went, she was never happier than when she had a child in her arms or on her lap. She was able to talk to young people, and she was always interested in their world. The pain of not having any children soon turned into an unconditional love for all Belgians and all children, as if each of them was her own. And that love was mutual: the Belgians saw their King and Queen as a real father and mother of the nation. Never was that feeling so obvious as when the King died of a heart attack in 1993 at his summer residence Villa Astrida in Motril, Spain. The country seemed adrift. Baudouin had reigned for 42 years, and suddenly he was gone. Nobody felt that emptiness more than the Queen widow. But in this hour of need she saw and felt that the entire country mourned with her, a country which had not only lost its Head, but also its heart. The Queen was heartbroken after the sudden loss of her husband, and yet she managed to radiate the hope and the belief that one day they would be together again when she walked in front of that funeral procession, the Queen in white. Right after the funeral, she was an emotional wreck. The loss of loved ones is always hard to cope with, but when you are a public figure you cannot deal with your pain alone. Fabiola fled to her sisters Ana Maria and Maria Luz in Santiago de Compostela, where she stayed for a long time, away from the cameras and public attention. Even though Fabiola now has to live and work in the shadow of her in-laws, she does not hide away. She still actively promotes women’s rights and fights against all kinds of social injustices. And lately, she has been actively enjoying the new-found freedom those shadows provide. Fabiola has always been a time scheduler’s worst nightmare. Even in her youth she was always late, or maybe just in time, because she could never resist talking to people. When she became Queen, she revolted when she learned about the strict rules she was supposed to follow. If she had two engagements on one day, she was often late for the second because her entourage could not get her away from the first in time. She would always keep chatting to the people who were waiting for her and lose track of time. Now that she is no longer the wife of the Head of State, protocol is less strict. The Queen is enjoying life to the fullest, and has more than once surprised the world by suddenly revealing sides of herself nobody knew before. “The more the time passes, the more it makes me feel alive,” she has written. And this is true. Despite her age, her frailty, and the loss of her husband and her position in her country, Fabiola is blossoming like a young girl. She is exploring the boundaries of her new freedom, and seizes every opportunity to attract attention and leave an unforgettable impression. She wants people to remember her spirit and her liveliness. She has become even more open; she laughs and is happy. She doesn’t need to uphold the image of the dignified wife of a monarch, she can just enjoy whatever she does. Journalists almost fight for the privilege of following the Queen widow on an official visit, because they never know what she might do next. Who does not remember the almost incredible footage of the Queen who suddenly began to dance during the performance of a Belgian pop group, Mint, at the castle of Laeken? I remember that my mouth fell open, and I wasn’t the only one. Even the singer skipped a note, so great was his surprise. The Queen widow never cared about “frivolous” things like makeup, designer clothes, or luxury. Fabiola and Baudouin always drank water with their meals at home, even though they would open a bottle of wine for their guests. Their lifestyle was very down-to-earth and almost ascetic, especially in comparison with other royal families. The interiors of their private apartments at the Palace of Laecken, their chalet in Opgrimbie, or the holiday home in Motril were not at all luxurious, though not uncomfortable either. Fabiola is often accused of taking away the glamour of the Belgian royal family, and this is partly true. She hardly ever organized lavish parties at the Palace, and when it comes to fashion she is not remotely in the same league her sister-in-law Paola, who, on an official visit to Luxembourg, wore no less than twelve outfits in four days. Fabiola was not uninterested in clothes as such, but she was horrified by the excessive amounts of money one had to pay for designer dresses. Some people even claim that Fabiola was so shocked that she made a habit of borrowing evening dresses from couturiers, only to have them copied by her own seamstresses. Then she would hand the original back and appear at an official banquet in her fake dress. She definitely still does not really care about her appearance. During the official visit of the Crown Princely couple of the Netherlands, she didn’t hesitate to make her appearance in a forty-year-old dress. She will throw together a mishmash of jewellery whenever she goes out: a gold brooch left, two or three hairclips right, whether they really match or not. The only part of her appearance she is particular about is her hair. She has never changed her hairstyle since her engagement, because she knew Baudouin liked her hair that way. She is so persistent about her hairstyle that she sometimes even wears a wig, just to be sure that her hair always looks the same. Fabiola still has an eye for those whom others might easily disregard. Once she even asked a cameraman if his camera wasn’t too heavy. First she asked in French. When she noticed he was Flemish, she asked again in Dutch. The cameraman answered that he was used to it, but then he hardly knew how to hold his camera when she commented that he must be a really strong man. But there are more remarkable events taped on camera. Some years ago, on All Soul’s Day (2 November), the journalists of the VTM tv programme Royalty followed the Queen during Mass. When later she went into the Royal Crypt, one of her staff stopped the cameras from following her, but the Queen asked them to come along. Then right in front of the camera, she started reciting a prayer about Jesus’ bride. I cannot help but think that a conservative Catholic, which is how she was always portrayed, would never do this. It is clear that Fabiola is preparing for her eventual death. The childless Queen, determined not to be forgotten by the country she dedicated her life to, has started to make remarkable statements whenever she knows the cameras are pointed at her. That way, for instance, she revealed that she had lost five children through miscarriage, which is more than any biographical source had declared thus far. She has not only adopted a more relaxed way of life, but she is also trying very hard to straighten out the issues between herself and those she loves. Some people say, for instance, that she was the one who saw to it that Laurent was accepted again in his family after a long train of scandals, of which the infamous marine trial was the absolute low. “Le Roi, c’est la Reine”, André Cools once said, referring to how Bauduoin and Fabiola always seemed inseparable. This was certainly true when the King was still alive, but even after his death the Queen widow never truly seems to be without her husband. To Fabiola, Baudouin is not really dead. She still talks to him, and she likes nothing better than to talk about him with people who knew him. She always wears his watch and a locket with the image of the late King engraved in it. Death no longer scares her, on the contrary; it gives her hope, every day, because she knows that one day they will be together again. Balfoort, Brigitte & Joris De Voogt. Koningin Fabiola, Een meisje van 80. Leuven, 2008.
van den Berghe, Jan, Kroniek van 100 jaar Europese koningshuizen, Ghent, 1999. Van Daele, Henri. Zes Koninginnen. Tielt, 1996. De Jonghe, Ralf. Koningin Fabiola, Vrome vorstin in een vluchtige wereld. Antwerp, 2008. McNaughton, C. Arnold. The Book of Kings: A Royal Genealogy. Vol. 1. London, 1973.
de Mora y Aragon, Fabiola. Los doce Cuentos maravillosos, 3rd ed. Sinople, Bilbao, 1960. Séguy, Philippe, & Antoine Michelland. Fabiola, La reine blanche/Koningin in het wit. Paris/Antwerp, 1995. Suenens, Léon. Koning Boudewijn, Het getuigenis van een leven/ Le roi Baudouin, une vie qui nous parle. F.I.A.T., 1995. 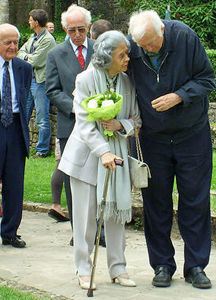 Photos of Queen Fabiola's visit to Orval taken by Flickr member Little Firefly and used with permission. Collage of Queen Fabiola, showing the characteristic hairstyle over several decades, by Royal Forums member TheTruth and used with permission. Photos of the wedding of King Baudouin and Queen Fabiola from the Royal Forums avatar collection. 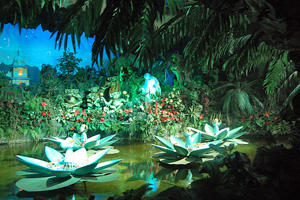 Photo of the Indische Waterlelies attraction at Efteling taken by Flickr member drhenkenstein and used with permission.